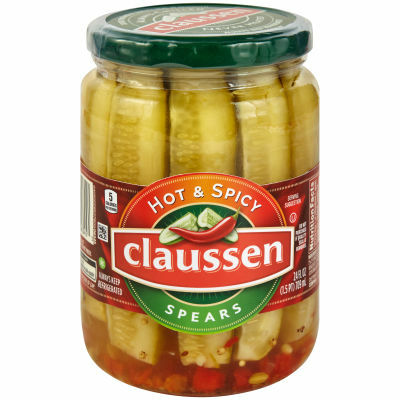 Claussen Hot & Spicy Pickle Spears are always chilled and never heated to deliver its signature taste and a bite that is always crisp. Claussen is the leading refrigerated pickle brand for good reason - its freshness and bold crunch elevate any meal. Even our brine is flavored with spices like turmeric, garlic, and red pepper, for a difference that you can not only see but also taste. Add a kick to any sandwich, burger, or entree with the crunch of a Claussen pickle or enjoy it as a guilt-free snack at only 5 calories per serving. For easy and convenient storage, our pickles come in a resealable jar. Serving size 1 oz (28g/about 1 spear).